Shiplap Update! I know you’ve been wondering “what’s going on with Shiplap?”. Ever since Chip & Joanna Gaines joined the HGTV family, it seemed that their show, Fixer Upper enjoyed instant stardom. And with good reason, they brought a fresh attainable design perspective to life. More importantly, their design sensibility emanated from love, family and an appreciation for a sense of history. But for some, the most significant aspect of their show was that they introduced us to the world of Shiplap possibilities! Original Shiplap was part of the building structure and was not commonly used in all geographic areas. That’s why it’s such a surprise to find it behind layers of sheetrock. 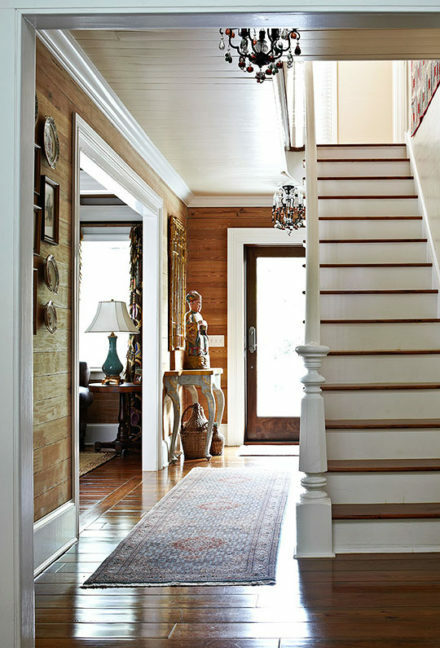 In the image below from TraditionalHome.com, this Key West Summer Home has original Shiplap walls, quite beautiful. 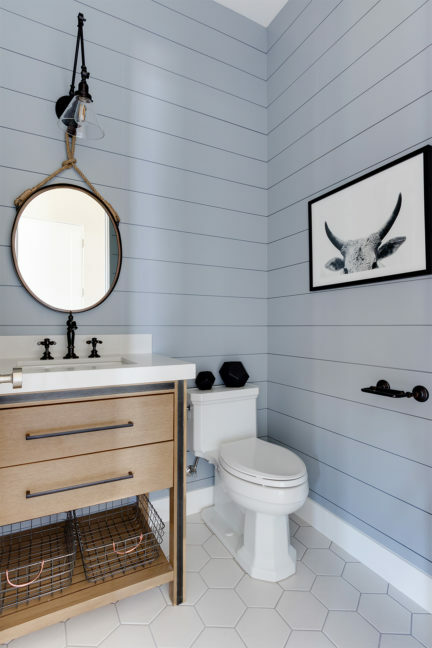 However, with Nickel Gap or Shiplap Style Paneling, you can achieve the same look by just taking a trip to the local home store for materials. First, the bathroom below is in a new home build. And with a beautiful nickel gap wall treatment painted in a soft neutral tone, I’m sure it is a hit with home buyers. 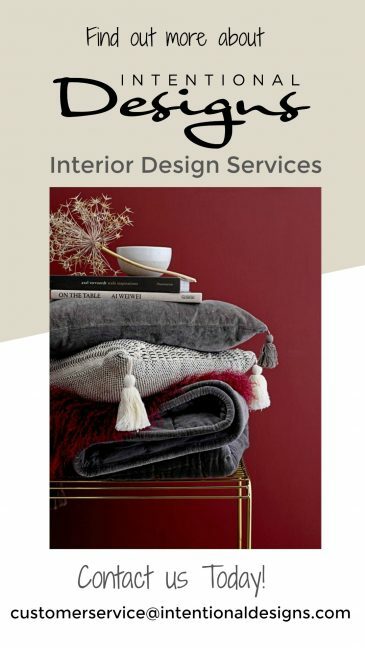 2019 Paint Color Forecast, bhg.com, Image courtesy Millhaven Homes; Photo by Rebekah Westover. Second, this horizontal plank wall treatment is the perfect architectural element to incorporate into this design filled space. Often times I will look at a design and take away an element, and imagine how the room would feel. Consequently, in this entrance, I could not imagine the walls to be simply painted or even wallpapered. 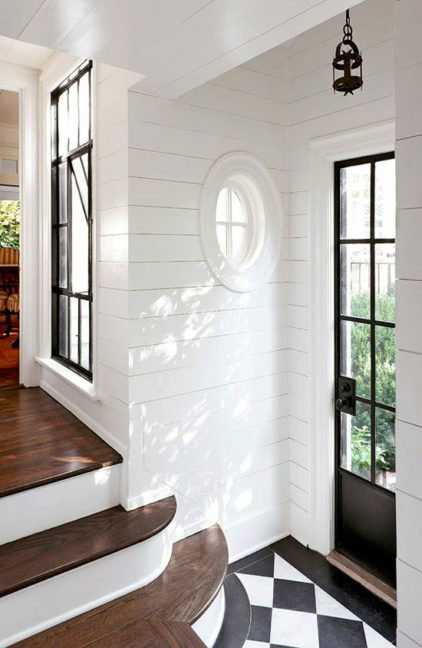 Together with a black & white tile floor, a swooping wood & white stairway, black window & door mullions, and a porthole window there is an undeniable sense of old world charm & character. Lastly, a Shiplap Update can be very simple. Third, a Shiplap update can be as simple as an accent wall; such as the fireplace wall below. 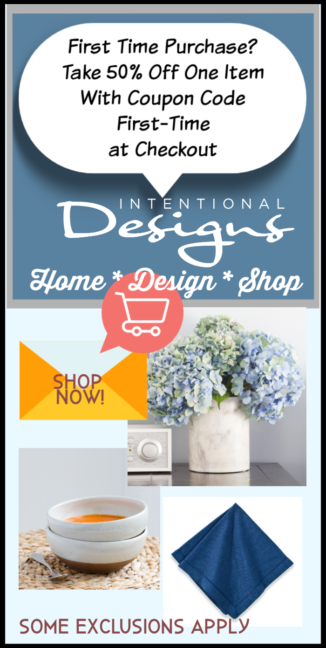 All in all, Shiplap, Nickel Gap or Horizontal Wall Plank is a design element worth exploring for your home. 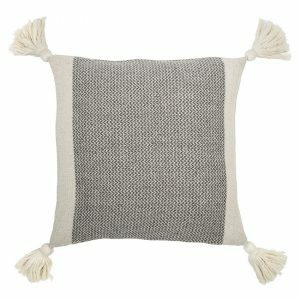 In spite of its popularity, this wall treatment has long been used as a design element from vacation homes to loft spaces. So next time you are wondering what to do with that wall, take a closer look at a Horizontal Wall Treatment.